Dr. Paulo Malo, a dentist in Portugal, in cooperation with Nobel Biocare, has developed what he calls the “All-on-Four” technique for dental implants. The problem he is trying to address is restoring the mouths of patients who have lost all their teeth and don’t have much bone left to retain dental implants. Often these patients require extensive bone grafting procedures, which is time consuming and expensive. Dr. Malo found that if he placed all the implants in the anterior of the jaw, where there is usually better bone density, and if those implants were highly angled, they could provide stable support for a complete denture. The radiograph on the left and diagram on the right illustrate this technique. Here is a panographic x-ray of the four angled implants that have been placed. You can see above that the implants are highly angled. But notice that the exposed tips of the dental implants, the part sticking out of the bone, are all pointed upward and are relatively parallel. On the right you can see that when the denture is screwed on, the screws are all placed normally, because the angulation all occurs under the surface of the tissue. But this technique isn’t without its critics. One renowned implant dentist in Phoenix who has pioneered other techniques, after thoroughly studying the All-on-Four technique, is concerned about its risks. If one of the implants fails, the entire mouth has to be re-done, and he feels that this is an unacceptable level of risk. 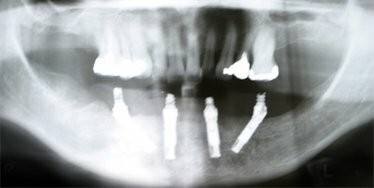 Some leading implant dentists have been reporting higher rates of failure with this technique. Still others feel that there is no increased risk. 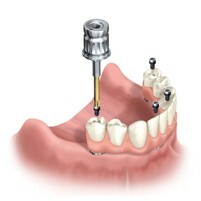 The result is that some accomplished implant dentists will work with the All-on-Four technique, others refuse to do so. We advise you, before you have your dentist use this technique for you, that you be sure your dentist is highly experienced and willing to stand behind his or her work.